The Website Awards displayed on this page were presented by fellow Aviation Units, Military Community and Vietnam Veteran groups. We are proud and honored to have received these awards.- - Thank You! Congratulations, Ned Costa from American Veteran Search. We are proud to tell you that your website has been chosen to be featured in our AVS Monthly Newsletter in the "Top 10 Patriotic Site Award" section. We have spent the time reviewing thoroughly the "Casper Aviation Platoon" website. We are incredibly amazed at the growth and the competent manor in which you have taken to bring this worthwhile endeavor to America's Veterans. Veterans mostly forgotten by the citizens who enjoy their freedom fought and won with tremendous sacrifice by veterans. Veterans prepared to fight, and having given of themselves in many conflicts throughout American history, deserve more. It is obvious your tremendous love of our American Veterans who served their country. It is with much Pride that we present you with our, "Patriotic Site Award". Congratulations Ned, your site has been selected to receive the American Association Of Webmasters "Silver" Award. We see all the hard work and dedication that you have put into constructing your web site and your efforts are well deserved. CasperPlatoon.com displays: Excellent Design and Layout of Website, with quality content and informative information for your visitors. Your site is a wonderful contribution to the Internet Community. Congratulations once again. 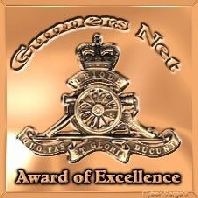 Congratulations Ned, We would like to award your website our Gunners Net Award of Excellence. You have got a outstanding website. Congratulations. Ned, your website has been awarded the Gold Site Award for website excellence. Display your Gold Wings with pride. 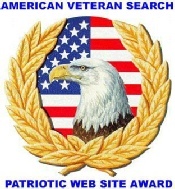 Your site has been reviewed and we wish to issue you the Patriot Award with thanks for your hard work on your website. We found your site to be an outstanding example of military and patriotic efforts to preserve history and hope you continue this great effort far into the future. Thank you once again for your time and efforts. Your website has been awarded with the Gold Award for website excellence. Congratulations! Your website has earned Sgt Pleiku's Patriotic Spirit Award.